There are markedly different population structures—and therefore care needs—in different parts of the world. 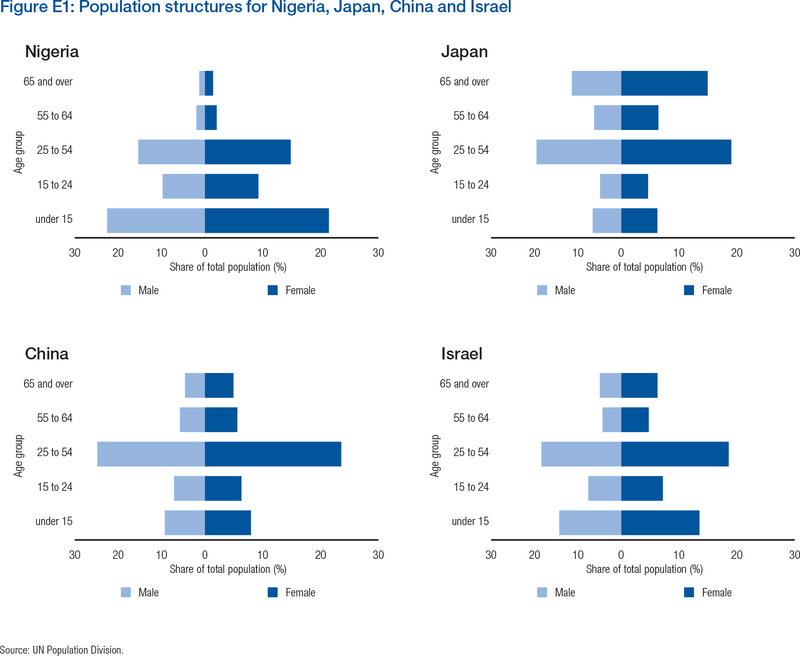 Economies such as Japan have a largely ageing population; conversely, Nigeria has a large young population. Israel has a strong concentration of both children and older people, while China will have a rapidly ageing population in the near future. 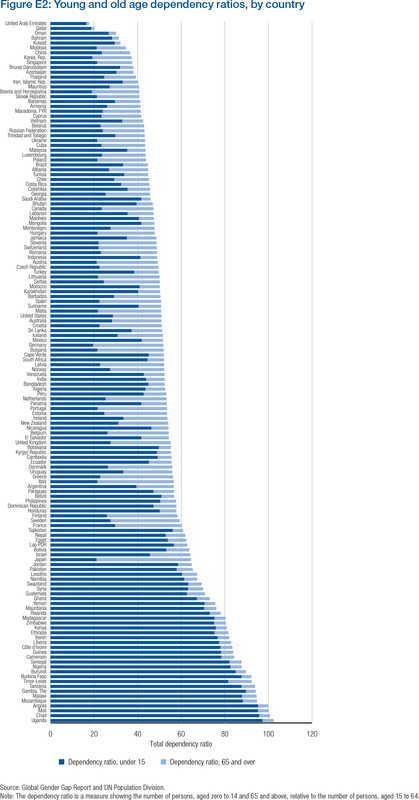 Figure E1 visualizes the population structure in these countries. Demographic structures do not simply reflect the degree of care responsibility, they also point to a further case for women’s economic participation. For example, in ageing economies there is a need for maximizing the human capital deployment of the working-age population in order to maintain economic dynamism. Therefore, policies that better allow caregivers—parents of children or children of older persons—to better combine work and family responsibilities can play a role in maximizing labour force participation, including that of women, in ageing populations. Demographic structures also point to a greater need for investment in girls’ education—a critical factor in preventing early marriage and pregnancy and providing multiplier effects that impact entire populations. On average globally, the dependency ratio of those under age 15 and over age 64 on the working-age population is just over 50%—meaning that, statistically, there are two working-age persons in the global population for every older person or child. Young-age and old-age dependency ratios look different by economy. They are visualized in Figure E2 (below), reflecting both unpaid work responsibilies for primary caregivers as well as paid employment opportunities for the core working-age population.